This week the letter at my Preschool was “I”. We did inside, insects and igloo but I think the one the kids loved best was Ice Age. 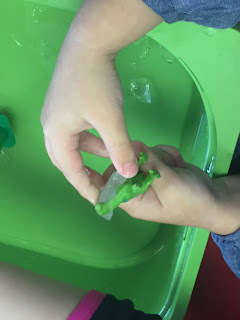 We took a balloon and stuck a toy dinosaur inside, filled with water and put it in the freezer over night. In the morning we cut the balloon in front of the class to reveal a frozen orb with a suprised inside. Our class is 2-3 year olds and they were so excited to see the dinosaur. 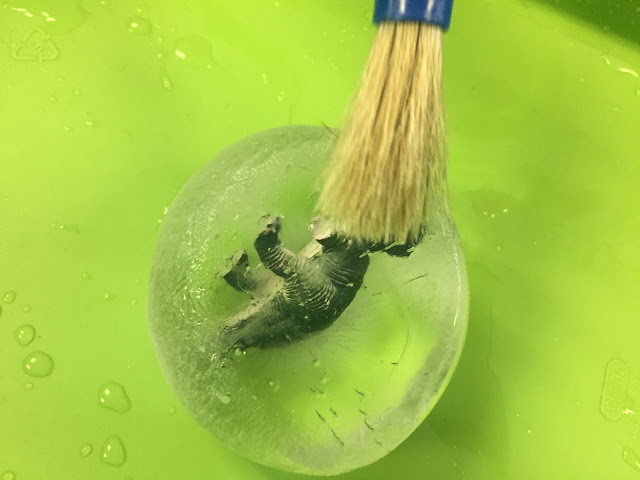 We gave them a spray bottle of water and a paint brush to take turns trying to uncover more of the dinosaur until we were finally able to get it out of the ice. This is the second year we have done this and I can tell you the kids love it. It takes a while but that is the best part. Their interest in hearing more about dinosaurs, turn taking and coaching each other is what we love most about this activity. The kids really get excited for each other as they see more of the dinosaur. I really wish I had done this with my kids when they were little.